The sign-up bonus on the Virgin Atlantic World Elite MasterCard® credit card from Bank of America has just increased to 90,000 bonus miles. The terms on the offer include several requirements to earn the full 90,000, and simply put things it is more of a 75,000 mile offer after spending $12,000 within the first 6 months. Although this is the highest offer I have seen on this card it is still not among the most lucrative credit cards available, that said the credit card offer could be useful to some. Annual fee of $90 is not waived for the first year. The offer expires on September 7th. Taking a closer look at the offer, the bonus breaks down to earning 20,000 miles after the first purchase, 50,000 miles after spending $12,000 within 6 months, 2,500 miles for adding an authorized user (you can add up to two, for up to 5k miles), 7,500 miles for spending $15,000 in the first card membership year, and an additional 7,500 miles for spending $25,000 or more in the first card membership year. To say the least the terms are lengthy to earn the full 90,000 miles. If you end up going for this card it is likely worth it to spend the additional $3,000 over the $12,000 spending requirement to earn the 7,500 miles in the first year for a total of $15,000 (earning 1.5 miles per dollar). If you take this route you will end up earning a total of 105,000 Virgin Atlantic miles after hitting the spending requirement. If you spend $25,000 or more on the card you will only receive 7,500 more miles, which does not seem worth it. This 100k mile threshold could be valuable to hit for US based flyers since it costs 100k miles for a round trip Upper Class award. For smaller spenders there is also an older version of this card that offers a lower sign-up bonus and has a lower spend requirement. While Virgin Atlantic’s Flying Club is not the most valuable airline program out there, what I find interesting about the program is that their miles can be transferred to Hilton at a ratio of 1:1.5. Based on the 90,000 points sign-up bonus alone this bonus could be worth 135,000 Hilton HHonors points. If you end up spending the $15,000 on the card within the first year you will earn 105,000 Virgin Atlantic miles or 157,500 Hilton HHonors points. It only costs 5,000 points per night at the DoubleTree in Kuala Lumpur. For comparison’s sake, if you are purely interested in earning Hilton HHonors points, then the Amex Hilton HHonors Surpass card may be a better option, especially for long term earning and manufacture spending. The current sign-up bonus on the Amex Surpass is 60,000 points after spending $3,000 within the first three months. To earn the equivalent 157,500 Hilton points with the Amex Surpass card you would have to make a total spend of $16,250 in the 6X grocery and restaurant bonus spending category. If you are strictly looking to manufacture spend, then that is only $1,250 in additional spending and you have the option to produce a lot more Hilton points through purchasing gift cards at grocery stores and earn 6X points per dollar. What is the Sign-up Bonus Worth? In either case you could easily get up to $1,000+ in free Hilton stays from the sign-up bonus, and redeeming points for stays at a lower-tier category 1 property could come close to $3,500 in value. However, both of these uses of points will come in below the value you would get for a Upper Class round trip flight redemption from the West Coast of the US to London, which can easily run $7,000+. The drawback is that you can expect to pay $1,200 in taxes and fees on an Upper Class award to London from the US. Ramzi, considering other card options out there it’s not really going to be worth it to put the $25k spend on this card for the extra 7,500 miles. 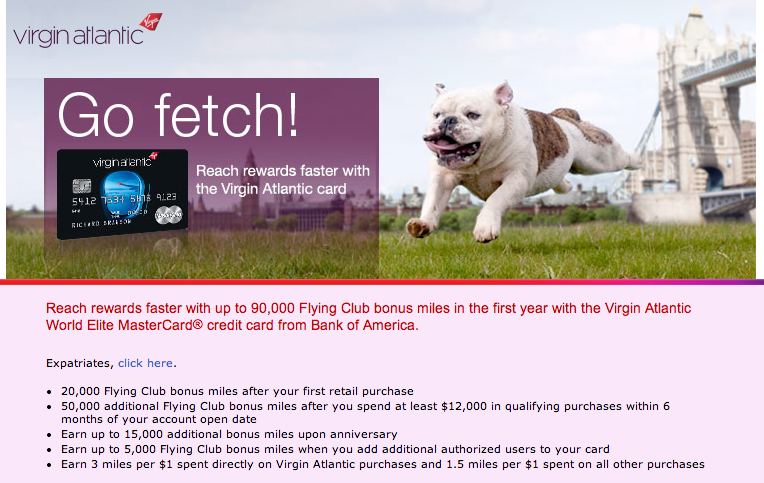 Even in the case of using the Amex Surpass for bonus spend categories to earn Hilton points, you’d earn 60,000 miles vs. 22,500 on the Virgin Atlantic MC for the same additional $10k spend.